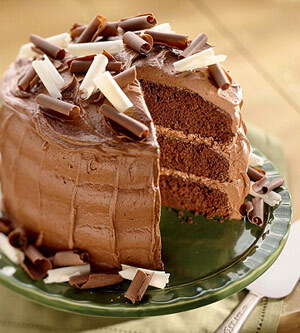 This impressive three-layer chocolate cake looks hard to make but isn't. It only take 30 minutes to prepare. Allow butter and eggs to stand at room temperature for 30 minutes. Meanwhile, lightly grease bottoms of three 8x1-1/2-inch round cake pans. Line bottoms of pans with waxed paper. Grease and lightly flour bottoms and sides of pans. Or, grease one 13x9x2-inch baking pan. Set pan(s) aside. Preheat oven to 350 degrees F.
In a medium mixing bowl, stir together the flour, cocoa powder, baking soda, baking powder and salt; set aside. In a large mixing bowl, beat butter with an electric mixer on medium to high speed for 30 seconds. In a small bowl, combine granulated and brown sugar. Gradually add sugar mixture, about 1/4 cup at a time, beating on medium speed till well combined (3 to 4 minutes). Scrape sides of bowl; continue beating on medium speed for 2 minutes. Add eggs, one at a time, beating well after each addition. Beat in vanilla. Add flour mixture and buttermilk alternately to beaten mixture, beating on low speed just till combined after each addition. Beat on medium to high speed for 20 seconds more. Spread batter evenly into the prepared pan(s). Bake for 30 to 35 minutes or till a wooden toothpick inserted in the center comes out clean, or bake 45 to 50 minutes for the 13x9x2-inch pan. Cool cake layers in pans for 10 minutes on wire rack. Remove from pans. Peel of waxed paper. Cool thoroughly on wire racks. Or, place 13x9x2-inch cake in pan on a wire rack; cool thoroughly. Makes 12 to 16 servings. To assemble, place a cake layer on a cake plate. Spread with 1/2 cup of the Cocoa Mascarpone Frosting. Top with second cake layer; spread with another 1/2 cup of the frosting. Top with the remaining cake layer. Frost top and sides with remaining frosting. Top with chocolate shavings, if you like. For the 13x9x2-inch pan, frost just the top of the cake with half of the frosting; cover and chill remaining frosting for another use. Top with chocolate shavings, if you like. Cover and store frosted cake in the refrigerator. Making Sour Milk: If you don't have buttermilk on hand when preparing baked goods, substitute sour milk in the same amount. For each cup of sour milk needed, place 1 tablespoon lemon juice or vinegar in a glass measuring cup. Add enough milk to make 1 cup total liquid; stir. Let mixture stand for 5 minutes before using. In a large mixing bowl, beat mascarpone cheese, butter, cocoa powder,milk and vanilla with an electric mixer on medium to high speed till creamy. Gradually add powdered sugar, beating till smooth. Beat in enough additional milk, 1 teaspoon at a time, to reach spreading consistency. Makes 3 cups.